Matthew Bartholomew is a fictional physician living in fourteenth-century Cambridge. He is a master at the College of Michaelhouse at the University of Cambridge, where he teaches medicine. The series begins with the imminent arrival of the plague (the ‘Black Death’, although this wasn’t a term that was used at the time). Like all medici of his age, Bartholomew is concerned that his remedies may not be effective, and dreads the onslaught that is about to come. A Plague on Both Your Houses takes place in that devastating time of fear and uncertainty. The rest of the series is post-plague – which was an equally terrifying time. People thought God and His saints had deserted them in their darkest hour, and it did not go unnoticed that the mortality rates were high in some of the religious foundations: the Cambridge Dominicans were wiped out to a man. Why should people listen to the Church when the Almighty had ignored the prayers of His priests? Some settlements dealt with the question by rededicating their churches to the Virgin Mary, on the grounds that she might be more open to petitions, while others turned to more ancient religions or witchcraft. Countless villages lay deserted, and the entire population of All Saints’-next-the-Castle in Cambridge died, so there were many empty properties and abandoned farms. Labourers were in short supply, so they began to demand higher wages, which was one of the factors leading to the Peasants’ Revolt of 1381. It was thus a time of religious and social upheaval, and there was always that niggling question: would the pestilence come back to wreak havoc a second time? Bartholomew was raised by his sister Edith. He went to the Abbey School in Peterborough, and then studied at the University at Oxford. While there, he heard about an innovative Arab medicus teaching in Paris, and travelled there to begin an apprenticeship with him. He returned to Cambridge, where he was offered a Fellowship at Michaelhouse. His friend and fellow protagonist is the ambitious and portly Benedictine Brother Michael, based on one Michael de Causton, who was associated with Michaelhouse in the 1360s. Through the books, Michael gradually amasses power until he effectively runs the University from his ‘elected’ position as Senior Proctor. These are the Matthew Bartholomew mysteries, listed in order of publication. Click on the title for more details. It is 1348, and there are rumours that a great and terrible pestilence is sweeping westwards. But physician Matthew Bartholomew has more than that to worry him: the Master of his College is dead, and he strongly suspects foul play. The plague has finally left Cambridge, and Bartholomew is desperately struggling to train physicians to replace those who have died. But then a body is discovered in the chest where the University keeps its most precious documents, and he must put his teaching aside before the killer strikes again. Fears that the plague will return have prompted people to seek the protection of holy relics, but when the bones of a local martyr are conveniently discovered, Bartholomew is deeply suspicious. When three members of the University die from drinking poisoned wine, Bartholomew and Brother Michael are drawn into a criminal conspiracy that not only implicates relatives, friends and colleagues, but also mixes commercial greed and academic intrigue into a deadly brew of evil intent. When Bartholomew and Michael travel to Suffolk to assess a church that has been left to Michaelhouse by a wealthy benefactor, they discover that the idyllic countryside is anything but, and instead seethes with danger, superstition and bitter rivalries. 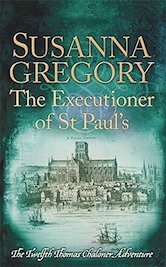 Bartholomew and Michael are forced to investigate when the Master of Michaelhouse is murdered and his body left on the banks of the River Cam. A theological debate is raging that threatens to tear the University of Cambridge apart. When a young friar is stabbed, Bartholomew and Michael must find the killer before the controversy claims more victims. When the Bishop of Ely is accused of murdering the steward of his bitter rival Blanche de Wake, Bartholomew and Michael travel into the wild and eerie Fens to investigate. Bartholomew is faced with problems of a personal nature when his former fiancée arrives with her new husband Walter. Trouble follows when Walter’s servant is murdered. The people of Cambridge are outraged when two convicted killers are given the King’s pardon. The pair return to the town to gloat – and to exact revenge on those who accused them. There is also a violent dispute between the town’s two mills, and when a body is found in one of them Bartholomew and Michael must race to find the killer before the trouble escalates beyond control. When Oxford explodes in a vicious riot, several of its scholars flee for the safety of Cambridge. But it is not long before one of them is murdered, and Bartholomew and Michael must find the killer before both universities are suppressed for harbouring rebellious troublemakers. Winter 1356, and Bartholomew and Michael travel to Lincoln. They soon find death and corruption stalk the cathedral city, and they have little choice in the matter when the Bishop compels them to investigate a series of brutal murders. When all of Cambridge’s landlords suddenly decide to increase their rents, the University scholars are outraged, and violence immediately begins to simmer between town and gown. Meanwhile, a mysterious healer has arrived in town, but when a body is found, Bartholomew cannot help but wonder whether the man is all he claims. Michaelhouse is in dire financial straits again, but the College’s problems are compounded when its best silver-gilt chalices are stolen, its Master is attacked, and its treasurer is accused of stealing. Shocked, Bartholomew sets out to prove his colleague’s innocence, but he has problems of his own to resolve, too – his medicines cabinet has been raided, and a woman may have died from being fed what was taken. When a wealthy benefactor is found dead in Michaelhouse, Brother Michael and Bartholomew must find the culprit before the College is accused of foul play. Bartholomew and Michael travel north to lay claim to a church left to Michaelhouse by the Archbishop of York. However, there are other claimants to the building, and murder soon follows their arrival in York. Not all academics are pleased when a benefactor provides the University with a house for a new library, believing the donation has set a dangerous precedent. Then four men are discovered dead in the garden, and Bartholomew and Michael must find the killer before the University erupts in a frenzy of violence. When Brother Michael’s unpleasant new Junior Proctor is murdered at the procession beginning a ceremony to create a new College, no one knows if the murderer was actually striking at the University, the new Winwick Hall, or simply the dead man. 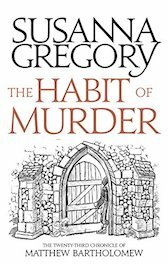 But other murders follow, which threaten to tear apart the already fragile relationship between the University and the town’s powerful Guild of Saints. A series of inexplicable illnesses ending in death ravages Cambridge and its local environs. Matthew Bartholomew’s efforts to discover if the deaths are due to an unknown contagion or a mysterious poison are hindered by the opinions and actions of an arrogant physician recently appointed to the wealthy new Zachary Hostel. But are his actions borne of jealousy of Bartholomew’s reputation, or is there some other sinister reason? Brother Michael’s plans for leaving the University position to become a Bishop are threatened when Chancellor Tynkell is murdered. Was the killer the Devil, a friend of the King already convicted of murder and extortion, or a corrupt local mason? Despite being more concerned about the sudden and fatal decline of many of his patients, Matthew Bartholomew is drawn into an investigation that threatens the safety of both the town and the University. Matthew Bartholomew discovers that although Cambridge is dangerous, it has nothing on the little Suffolk town of Clare. When a Michaelhouse delegation visits the community, it is confronted with a bitter feud over the renovation of the town’s church and a series of nasty murders. Are the two related, and can Bartholomew and Brother Michael find the killer or will he still be lurking in the shadows when the townspeople come together to celebrate the re-opening of their place of worship?